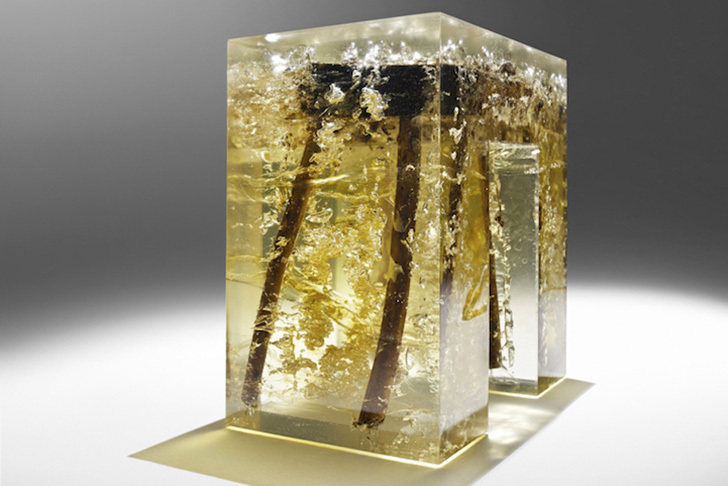 Turin-based Nucleo has designed a series of stools that look like blocks of marble, amber or even cracked pieces of ice. But upon closer inspection, you'll realize that it's actually organic material submerged in a hardened and cracked liquid polymer. Beautifully imperfect, these unique 'Souvenirs of the Last Century' crystallize branches fallen from a 200-year-old oak tree. The Italian design collective has been developing their simple technique over a period of several years. While they have previously submerged completed wooden tables and chairs, their new designs use centenarian logs. Akin to polished stones or fossils, these seats were made by dipping the wood into a cubic mould full of epoxy resin. Featuring bubbles, fissures and ruptures impossible to replicate or design, these functional art pieces will remain rough and natural. The Italian design collective has been developing their simple technique throughout the years. Like polished stones or fossils, these seats were made by dipping the wood into a cubic mould full of epoxy resin. While they have previously submerged completed wooden tables and chairs, their new, mysterious and archaic designs use centenarian oak logs. 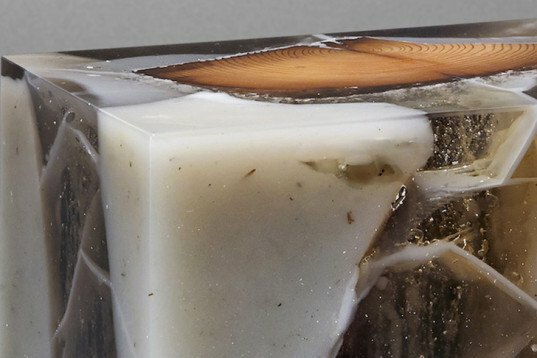 Nucleo's director Piergiorgio Robino explains why they work with resin, "It’s not a fine material, and many people don’t like to work with it." He continues, "There is no guidebook for it, but that also means there is a lot of opportunity to be really creative."